All spiders are predators, but most of them are small and have rudimentary defences against larger animals that in turn prey on them. Spiders have thus evolved a range of predatory behaviours that, at the same time, allow them to evade the threat of predation. Some of the most effective strategies involve deceiving ants. 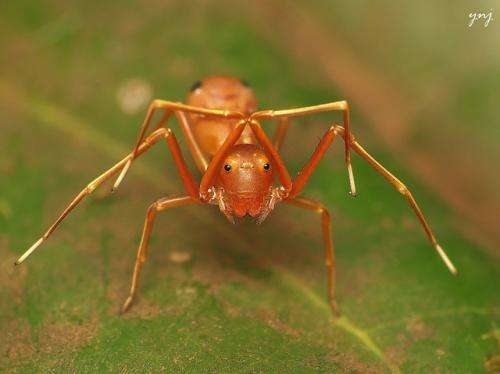 More than 300 species of spiders are known to mimic the outward appearance of ants, a phenomenon called myrmecomorphy. Aggressively territorial, ants are typically avoided by several predators, thus making them the perfect creatures to impersonate. Most ant-mimicking spiders have a "false waist" and are covered with reflective hairs to simulate the shiny, three-segmented bodies of ants. They have coloured patches around their eyes to make their simple eyes look more like an ant's compound eyes. The spiders also behave like ants by waving their front pair of legs near their heads like antennae, and adopting an erratic zig-zag pattern of movement that is more like ants than spiders. There are two reasons why a spider would want to mimic an ant: to eat them, and to avoid being eaten by them. The first reason, "aggressive ant-mimicry", is a rare but intriguing phenomenon – and it is employed by spiders to deceive their prey. Ants make for dangerous prey – they have strong jaws, poisonous stings, and chemical defences – and, acting collectively, can launch strong attacks. Aggressive ant-mimicking spiders thus prefer to attack their victims while they are alone. And after killing the ant the spider also has to ensure that other ants do not attack it while it carries the corpse to its nest. Aggressive crab spiders typically jump on a lone unsuspecting ant and bite it. Then, in order to avoid encounters with other ants, the spider and its victim fall away on a safety line made of the spider's silk while the venom takes effect. Others, like the ant-mimicking ground spider, use the body of their dead prey as a shield, holding it up between themselves and any other challenging ants. This tricks attacking ants into believing that the spider is just another ant, carrying a dead nest-mate away from their nest. At the other end of the spectrum is "Batesian mimicry", a tactic used by spiders to deceive their predators. Batesian ant-mimics dishonestly advertise the unpalatable characteristics of ants as their own, thus deterring those predators that have an innate aversion to ants. The best-known example of a Batesian mimic is the jumping spider, which is regularly preyed upon by both ants and other, larger jumping spiders. In one study, when an ant, an ant-mimicking jumping spider and a non-ant-mimicking jumping spider were simultaneously presented to a larger jumping spider predator, it was most often the jumping spiders that didn't pretend to be ants that were attacked, suggesting that mimicry was an effective anti-predation strategy. Some jumping spiders are also the prey of the far more vicious spitting spiders. The latter are so named because they catch their prey from a distance by spitting a liquid that contains both venom and spider silk from their fangs. In less than a second, the silk hardens on contact and restrains the prey, allowing the venom to take effect. The spider then bites its entangled victim and begins to wraps more silk around its body before carrying it back to its nest for feeding. To shield themselves from the lethal grips of these predators, jumping spiders turn to weaver ants for protection, presumably because the social and territorial nature of these tiny insects make them attractive defenders. Here, instead of mimicking the ant, the spider simply takes advantage of its close proximity. Spitting spiders typically build their webs above the nests of jumping spiders, carefully positioning them to ensure a direct target. It turns out, however, that if the jumping spider's nest has been built near that of a weaver ant, the spitting spider stays away. The presence of the ant's nest tends to enourage the jumping spider to build its nest nearby. This deters the spitting spider from spinning its web because the latter is repelled by olfactory cues released by the ant. But as if being targets of their predators isn't enough of a problem, the jumping spiders are also the food of choice for weaver ants. So jumping spiders have evolved to develop a defence strategy that protects them from those, too. To do this, jumping spiders build an "ant-proof" lair, weaving an abnormally tough nest that is difficult for ants to tear open. The nest also has silk flaps that serve as swinging doors. So, while the resident spider can enter and leave the nest by raising these flaps, the ants seldom attempt to manoeuvre this obstacle. In nature size matters. But as this story shows, brain can outwit brawn.